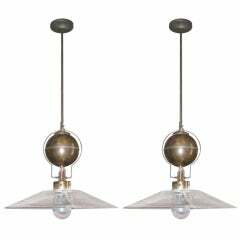 Reclaimed vintage Industrial Korean flameproof striplight made by Daeyang in the 1970s with copper veneer finishing and adjustable suspension bar. Original item salvaged from supertankers and military vessels then professionally restored in-house in the UK ready for modern interiors. Specifications: Height: 30cm Width: 30cm Length: 70cm Weight: 12kg Bulb: 4x Edison 300mm E27 filament. Compatible with 110v USA voltage The main body is copper veneered aluminum with steel and brass fittings. The tubes are formed from glass and are also flameproof. We apply approx. 2kg of copper giving the fixture a thick and substantial copper coating. 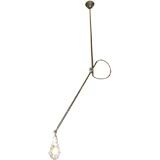 The suspension bar allows the light to be hung from one central point. The pipe is 22mm copper with cast brass fittings. All of the nuts, bolts and set screws have been replaced with a brass equivalent and each one is individually polished to a high lustre. All lights are professionally re-wired by in-house to exceed British Standards using CE approved components. Dimensions and weights are approximate. For all orders to USA, UL listed bulb holders and 100v bulbs will be fitted. All lights are sold ready for use in your home or commercial installation.